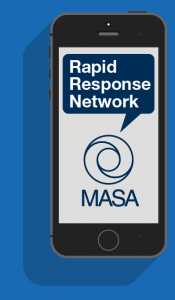 The Government Relations and Policy team is recruiting superintendents to be a part of the MASA Rapid Response Network. As a superintendent, you are a leader in your community, and your opinion matters to your state representative and senator. You have the ability to weigh in on education policy issues to help advocate for positive change for public education. By joining the Rapid Response Network, you will get alerts via text when there’s breaking news at the state Capitol. We’ll make sure you have the talking points and background you need to contact your lawmakers and have a meaningful discussion about the hot legislative issue of the moment. You can be a voice for change in Michigan education policy. Join the network today.